A veritable melting pot of the old and the new, Hyderabad, also known as the City of the Nawabs, is a city that exudes an old-world charm of its own while still coexisting with the rapidly growing onslaught of commercialization in perfect harmony. Steeped in history, Hyderabad is home to old mosques and bazaars lined parallelly alongside swanky new office buildings and malls, and it is these very contrasts – these glimpses into the city’s rich past with inherent promises of an even better future – this is what exactly makes Hyderabad a city worth visiting. Maybe even more than once. The most iconic landmark of Hyderabad is the Charminar, which is a distinguished monument that clearly exhibits the Indo-Islamic architecture of its times. Charminar, which literally translates to four minarets, is built entirely out of limestone and granite, with four minarets on four sides, each of them facing a different street. The Charminar is the oldest mosque in Hyderabad, and it has stairs leading to the second level, which is open for devotees to come and pray in. The entire stretch outside the monument is lined with little stalls selling pearls, bangles, and other jewellery, and this bazaar is bustling with both tourists and locals at any given hour of the day. Another impressive tourist attraction in Hyderabad is the Golconda Fort, which was considered as nothing less than an architectural marvel during its times. The entire fort is bordered by a 10-kilometre long wall, and with over 80 bastions, four drawbridges, and several mosques, halls and royal residences, the fort is nothing short of imperial. Today, while most of the fort is in ruins, hints of its regal ambience and its past grandiose still linger on. Hyderabad is very famous for being home to the Ramoji Film City, which is the largest film studio complex in the entire world. Built across a sprawling 2000 acres, the Ramoji Film City has seen a huge number of regional language, Hindi, and even some international films being shot here. Apart from offering studio tours, it even provides options for quite a number of sports and adventure activities, making it a very popular hangout for the younger generation. Who knows, you might even get to meet an actor there! An oasis in the midst of an otherwise landlocked city, Hussain Sagar Lake in Hyderabad is an entirely manmade lake which boasts of a 450-tonne statue of Buddha in the middle of the lake. Carved entirely out of white granite, the monolith shines brightly under the moonlight and is a beautiful place to sit and spend an evening under the stars. Hyderabad is famous for its food, and be it street food to casual dining to high-class fancy dining – you name it, and Hyderabad has it. Old City is teeming with dozens of roadside eateries where you can have your fill of lip-smacking biryani and kebabs. The most popular local dishes you should try out include the famous Hyderabadi biryani and Haleem. Charminar is the most prominent landmark located right in the heart of Hyderabad. The monument was erected when Quli Qutb Shah shifted his capital from Golconda to Hyderabad. It got its name from its structure as it consists of four minarets. The imposing structure looks awe-inspiring during the night when it is illuminated. The life around Charminar never ceases to throb, as this part smells and feels like the real Hyderabad. The area around Charminar is popular for colourful bangles, jewellery, pearls and scrumptious dishes. The essence of Charminar lies in four things - the laid back crowds, the packed markets, the lip smacking biryani and the Irani chai! Since the construction of the monument in 1591, Charminar is synonymous with the culture of Hyderabad standing tall as a reminder of the glorious days of the past era. It is a massive structure which has four minarets which many believe stand for the first four khalifas of Islam. It is situated on the east bank of Musi River and stands tall amidst the labyrinthine Laad Bazaar in the old city. The Charminar is an example of unpatrolled artistic brilliance, and it is also considered to be one of the marvellous structures in India. Towards the north of Charminar, there are four gateways known as Char Kaman which is constructed in the cardinal directions. The structure was intended to serve as a Madrasa or a Mosque. It is mainly built of Indo-Islamic architecture along with the incorporation of Persian Architectural elements. Charminar, along with Qutub Shahi Tombs and the Golconda Fort has been added to the "tentative list" of UNESCO World Heritage Sites. Set up by Ramoji Rao, the head of Ramoji group in 1996, the Ramoji Film City is a beautiful holiday get away with cinematic themes in the happening city of Hyderabad. There is so much for you to see, learn and experience as new treat comes towards you from every nook and corner. It is also certified as the World's largest Filmstudio Complex by the Guinness World Records. Ramoji film city is a proud destination of India that attracts millions of people every year due to its unique and beautiful themes. It is said that a movie director can never leave without making a movie here, such is its inspiration. Tap your own Bollywood dreams at the Ramoji Film City, where you can indulge in a number of activities ranging from film city tours to adventure sports, toy train rides to a number of gardens. Smaller renditions of famous monuments in the country such as the Amer Palace are also present here. What's more, you can also stroll through a number of other sets and settings such as royal courts and other locations which have drawn inspiration from different architectures throughout the world. If you decide to visit this destination after all, be sure to keep aside an entire day for this fun - filled location! Once the seat of the Asaf Jahi dynasty, the Chowmahalla Palace was built in Hyderabad between the years 1857 and 1869. This splendid monument served as the official residence of the Nizams of Hyderabad during their reign. The edifice of the Chowmahalla Palace was the main venue where the Nizams used to entertain their guests and other special visitors and organise many elaborate ceremonies. The palace is designed very intricately and is well known for its unique style and elegance which holds a unique Nawabi charm in itself. It is still the property of Barkat Ali Khan Mukarram Jah, heir of the Nizams and has been decorated with UNESCO's Asia Pacific Merit award in 2010 as well. The architecture of the Chowmahalla Palace is an imposing sight to behold. The facade itself is a delicate artwork of domes, arches, windows and meticulously carved out designs. The complex is elegantly embellished with gentle fountains, expansive lush gardens, numerous palaces, Clock Tower, Roshan Bangla and the Council Hall. One of the most outstanding features of the magnificent palace is the Durbar Hall which is also known as the Grand Khilwat. The Courtyard here is a fairytale venue to hold the most exquisite dinner parties, with the palace standing firmly in the background. The Chowmahalla Palace has been restored to its present glory with careful considerations and is now open to the public as both a historical extravaganza and delightful party location. The only place in Hyderabad where it snows throughout the year, Snow World is quite a hit amongst the locals and the tourists alike. It is the world's biggest and the first snow-themed park in India. What makes it unique is the fact that the snow here is produced by mineral water. Hence, this is one experience that you must not miss while in Hyderabad. With almost 3 tonnes of fresh snow added every day, finding ground in this amusement park will not be as easy as you thought! It was built at a cost of INR 20 million and was designed by Nitish Roy, an Indian art director, production designer and architect. Snow world is India's first biggest snow park and third biggest in the world. Inaugurated by Chandrababu Naidu on 28 January 2004, Snow World is all about the snow inside it. No matter what the season, once you are in you will be in a world of your own. There are slides, play areas, sculptures and mountains that are all made up of the artificial snow. You will also be provided with warm jackets, shoes, socks and gloves to have fun without freezing out there. There is also a beautiful Ice hotel where you can gorge on tantalizing Icy Food! Renowned as Asia's largest artificial lake, the Hussain Sagar Lake is one of the most popular tourist hotspot situated in Hyderabad. The lake itself was built by Ibrahim Quli Qutub Shah in 1563 during the rule of Ibrahim Quli Qutub Shah. Renowned for its monolith of Lord Buddha which is right in the centre of the lake, this place is famously known as Tank Bund as well. Interestingly, the imposing statue of Buddha was a much later addition to the Hussain Sagar Lake. The attraction also has 3 km long dam wall and connects the twin cities of Hyderabad and Secunderabad. Although the Hussain Sagar Lake is popular for activities such as fish culture, water sports and boat rides, the major attraction of the lake is a monolithic Buddha statue situated right at the heart of the lake. The statue of Buddha was installed in the year 1993 and was inaugurated by His Holiness Dalai Lama himself. Standing at the Tank Bund, you can see an outline of the lake done by lights appearing as a diamond studded necklace. Thus, the road is also known as the 'Necklace Road'. Owing to its unique heart - shaped outline, the Hussain Sagar Lake has been declared as the 'Heart of the World' by UNWTO. Situated in the Western part of the beautiful city of Hyderabad at a distance of near about 9 km from Hussain Sagar Lake, the Golkonda fort is spread over an area of three square kilometres which is 4.8 kilometres in length. This mighty fort falls in the list of the most humongous fortresses of India. One interesting phenomenon observed at the Golconda Fort is that if a person standing at a certain point near the dome entrance claps his hands, it can clearly be heard at the hilltop pavilion which lies at a distance of about one kilometre. In a way, this feature proved to be useful as with the help of this, people living inside the fort were warned of any approaching danger if any. Now, this is more or less used as a means of entertainment for the tourists. The oozing charm of the place makes it a must-visit. The Golkonda Fort showcases majestic halls, stables, magazines, four drawbridges and mounted cannons. The outermost area of the fort is known as Fateh Darwaza which means Victory gate (literally). Distinguishable effects can be observed at Fateh Darwaza which has been one of the major engineering phenomena at this glorious fort. Also, the mines here are known to produce some of the most coveted and popular gems ever known in the world such as Idol's Eye, the Hope Diamond, Darya-i-noor and the famous Koo-i-noor. Golkonda Fort comes to life with the light and sound show which takes place during the evening when the snippets from its past are shown giving a clear view of its rise and fall. With its fascinating history, the place is definitely worth a visit. Just adjacent to the popular landmark of Charminar, lies this famous and historic market known for its shopping articles. Laad Bazaar is said to be the oldest or one of the oldest markets in Hyderabad. The sparklingly colourful bridal bazaar (market), as it has also been called has been operating since the days of Qutb Shahis and the Nizams. Laad denotes the lacquer which is used to make bangles here that are studded with artificial diamonds. Laad Bazaar is a must-visit site to satisfy your shopping dreams, especially if you are a woman. There are more than 150 workshops located here that produce some of the finest bangles called lac bangles. With a touch of class, one lac bangle supposedly takes up to 3 hours of man work to complete. Also known as Choodi Bazaar (Choodi or Chudi refer to bangles in Hindi), the kilometre-long road is dotted with shops selling cheap jewellery, clothes, bangles and wedding items at reduced rates. Silverwares, paintings and fabrics are highlights of the market as well. The market is visited by thousands of tourists and shoppers every day. Laad Bazaar is located on the west face of Charminar, on one of the four main roads that emerge from the monument. There are numerous other attractions and places of historical importance nearby and being the radiant city Hyderabad is; the prominent landmark has attracted shopaholics and tourists alike for generations. The kilometre long shopping strip feels like a never-ending fair. On the outskirts of Hyderabad, also known as Gandipet is the Osman Sagar lake. Elless world, Ocean park and Treasure island surround this lake, making it a famous tourist destination. The water body was made by building a dam on Moosi River in the year 1920 by Mir Osman Ali Khan and the cities of Hyderabad and Secunderabad find a water source in this lake. Spend some relaxed and enjoyable time here, with gardens and a pool, all making it an ideal spot for picnics. In close proximity to Charminar, this is a rather royal museum, situated in the heart of Purani Haveli housing the memorabilia and artifacts of the then Nizam of Hyderabad. These include 1930 Rolls Royce, Mark V Jaguar and Packard. Among all these treasures and riches of royalty, also find the flattering gold-furnished throne, used during the celebrations, coffee cups made of silver and studded with diamonds, a gold tiffin box with diamonds and more. The city of Hyderabad is well known for its royal past and heritage, of which Purani Haveli forms an integral part. Displaying some of the most exquisite forms of craftsmanship, this palace was originally built to serve as the home to the Peshwa of Mohammed Quli Qutub Shah, Mir Momen. Today, Purani Haveli is undeniably one of the significant parts of Hyderabad's golden era and is known for its remarkable exhibits of artwork and talent. It is a beautiful structure comprising great surprises for history lovers. Many buildings of this huge complex currently serve as educational institutions. Swarming with a fascinating collection of items gifted to Mir Osman Ali Khan, the amazing VII Nizam of Hyderabad, the museum was a wish of his to tell the world about the achievements of the people of Hyderabad. The place comprises of a 240-foot long wooden chamber with some 150 walk-in-cupboards built by the sixth Nizam, which is claimed to be the world's largest wardrobe.The key highlights of the place are the remarkable exhibits of souvenirs, gifts, mementoes and models presented to him on the occasion of the Silver Jubilee Celebrations in 1927. The haveli with its fascinating collection is a must visit. Built especially for the adventurous lot, the mechanical and water rides here are ideal for a day full of enjoyment and excitement. With a startling amount of choices available on amusement rides, from Ferris wheel to Columbus, they also have a few eccentric ones like the Jumping Frogs, Thrillarium and the Alien Planet. And there is the whole Waterworld with Adult slides, wave pool and Rain Dance. If you do not like the wetty and icky feeling of all the water in this park, you could relax with your friends and family in the indoor section and play a game or two of chess, pool table tenis or carrom. For those who get their adrenaline efflux only from some strict and intense working out, head over to the Bodyline gym, with expert trainers available on demand. Done with the sweaty and and hard workout, you can head to the sauna and massage section and loosen all those muscles. Next are the many consoles in the Broadband cafe to get engrossed in virtual adventures. And as the day comes to a close, head straight to Mount Opera's discotheque for a glittering and alive dancefloor. With about a 100 species finding habitat here, the Nehru Zoological Park is one of the most enjoyed attractions in the city. It is named after Pandit Jawaharlal Nehru and was opened to the public in 1963. Neighbouring the Mir Alam tank, it is also known as Hyderabad Zoo and houses the Indian Rhino, Asiatic Lion, Bengal Tiger, Indian Elephant as well as panthers, pythons, deer, and antelopes. Given the proximity to the tank, countless migratory birds also find a second home here. The Nehru zoo also hosts safaris and educational shows. Administered by the Forest Department of the Government of Andhra Pradesh, the Hyderabad Zoo covers an area of 380 acres. There are a number of safaris offered inside, which includes Lion, Tiger, and Bear Safaris. For kids, there are many fun activities and enclosures like the Dinosaur Park visit, Mini train ride and elephant rides. The zoo also has a museum detailing its natural history. A wide variety of wildlife flourishes here, be it herbivores, carnivores, reptiles, nocturnal animals or rodents. Migratory birds are known to arrive every year to the Miralam tank lake and its embankment, making it their home for a few months and adding to the biological diversity of the place. The wild animals here at the Nehru Zoological Park are kept in relatively open enclosures, unlike other zoos. The Salar Jung Museum is located at Darushifa, on the southern bank of the Musi River, in Hyderabad. It is one of the three national museums in the country and one of the largest in the world giving us an insight of civilizations that have preceded us. With over one million collections of paintings, sculptures, carvings, manuscripts and artefacts, the museum is a repository of art collections a few of which date as back as the first century. The collections are credited to the sole effort of Nawab Mir Yousuf Ali Khan. A painting of Raja Ram Mohan Roy, Aurangzeb's sword, daggers of Shah Jahan, Jehangir and a wardrobe of Tipu Sultan are a few prized possession of the museum. The Salar Jung Museum is the third largest museum in India and is the biggest one-man collection of antiques on the planet. It is very popular in India because of the collections of different civilizations dating back to the first century. The collection to the museum was sourced from the Salar Jung Family. The museum is a testament to the passion of Nawab Mir Yusuf Khan for arts and antiques. With over ten lakh visitors in a year, the museum is a perfect place to witness history. It also houses an excellent library with more than sixty thousand books and almost eight thousand rare manuscripts. The museum is a member of various historical and museological organizations, like ICOM-INC and Museum Association of India. It organizes regular exhibitions on different themes and also maintains a 'Mobile Exhibition Van' for outdoor exhibitions. World's largest masonry dam protected with 26 gates measuring 14m in height and 13m in width, Nagarjunasagar Dam located in Nalgonda District is built across River Krishna. The dam has a storage capacity of nearly 11,472 million cubic meters with an irrigation capacity for 10 acres of land. The dam measure 150m tall and 16 kms in length while also being a major tourist attraction. In fact, it is among the first irrigation projects started by Indian Government as an element of Green Revolution. Today, apart from offering not only irrigation facility, it is also a source of hydro-electricity. The dam attracts a huge number of tourists owing to its great magnificence as well as the cover of dense green surrounding it offering an absolutely captivating view. A one of its kind planetarium, the Birla Planetarium was inaugurated in 1985. With technological help from Japan, this planetarium has had some huge development. With periodical sky shows throughout the day, the theme is varied teaching us about various elements of the universe, such as comets, meteors, the cosmos, the eclipses. With its startling sound quality and the amount of information disseminated, Birla Planetarium and Science Museum is one of the places that a visitor should not miss in Hyderabad. Begum Bazaar is another wholesale market, an old and traditional shopping area and is the biggest commercial market in the city. One can find here all kinds of goods including gold, silver, dry fruits, household items and more. Also find the second largest fish market here of Hyderabad here. Situated in the city of Hyderabad, Durgam Cheruvu is a serene and picturesque lake that is an ideal place to spend some quality time with friends and family. Also known as the 'Secret Lake', the scintillating waters of Durgam Cheruvu are bound in the bosom of granite rocks which is a unique phenomenon in its own right. It is believed that the lake was the main source of water for the residents of the Golconda Fort, and hence, it has a great historical significance as well. The visitors here visit mainly for its calm and scenic beauty and the astonishing sight of the sunset that the place offers. In addition to its picturesque beauty, Durgam Cheruvu is the hub of many interesting activities as well. Durgam Cheruvu has recently emerged as the go-to place for the locals, whether its a party with friends or a family gathering. Located in the middle of Hi-Tech city, the lake keeps the visitors in touch with both the hustle of city life and the hassle-free life of nature. You can sit back and enjoy the beauty of the sunset, or take out your camera and go for a few shots of the surroundings as well. An artificial waterfall and fountain have also been created here which are easily a competition to any cascades high up in the mountains. Boating is a must do activity at Durgam Cheruvu as it gives you a chance to get up close and personal with this enchanting destination, and if you like to go on impromptu hikes, you can trek your way to the lake which is situated at a slight elevation. Situated away from the hullaballoo of the city, Durgam Cheruvu offers a peaceful getaway for one and all. 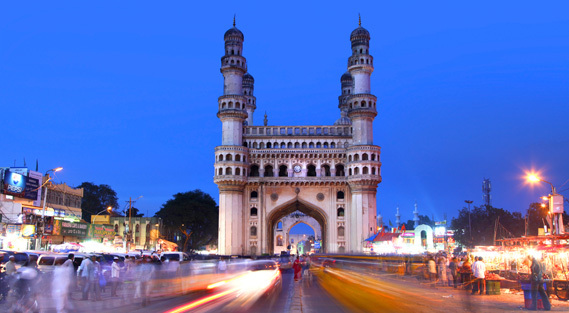 Hyderabad is also known as the 'city of sultans'. It has always been the leading choice of people for its aromatic cuisine, especially its Biryani. The city is also well-known for its exclusive jewelry, pearls, embroidered clothes and numerous street shops. It is the ideal place for shopaholics. It has beautiful, colorful and bustling bazaars which provide a memorable experience. Every bazaar is unique in its own way and has something different to offer from its peers. One must surely pay a visit to these shops whenever a trip to Hyderabad is planned. The cheapest shops in Hyderabad include- Koti Sultan Bazar for one's silverware needs. It was also known as residency market during the British rule. It has the latest stock for women and has stylish designs. It has a variety of products ranging from junk silver jewellery to exclusive designs and is a perfect stop for all the ladies out there. Begum Bazaar is also called the Begum of all bazaars in Hyderabad. It is an ideal place for the people with massive amounts of tobacco intake. It is by far the largest commercial as well as a retail market. Huge bargains take place in the market. The Birla Mandir of Hyderabad is built on a hillock of Kalapahad. The temples are constructed completely out of marble brought from Rajasthan. The intricate marble carvings blending the South Indian, Rajasthani and Utkal temple styles of architecture are simply beautiful. Also, the view from its highest point is breathtaking. Sri Venkateswara, or Lord Lakshminarayana, is the deity of these temples. The temples, however, are named after the Birlas, renowned industrialists of the country, who undertook the construction of these chain of temples all over India. Located about 30 kilometres away from Hyderabad, the famous Chilkur Balaji Temple is located in the small picturesque village of Chilkur and is a favourite pilgrim spot. The temple is situated on the banks of the Osman Sagar Lake, near the Vikarabad Road. The presiding deity at the Chilkur Balaji temple is Lord Balaji Venkateswara, along with Sridevi and Bhoodevi accompanying him. The temple houses the Visa Balaji or the Visa God, otherwise famous as a shining ray of hope and faith for US-Visa aspirants. It is believed that a visit to the temple, can grant the aspirants, a US Visa. The belief finds its roots in an incident when a few students who had their Visa applications rejected, came and prayed here only to have their applications accepted. The steps to pray for a visa here include a usual prayer and three rounds of pradakshina around the temple, followed by 108 rounds after getting the Visa. The temple is also reputed for being the oldest one in Telangana and is believed to have been built half a millennium ago during the time of Madanna and Akkanna, the uncles of Bhakta Ramadas. The architecture of the temple is also extraordinarily pleasing and never fails to fascinate the onlooker. A visit to the Chilkur Balaji Temple is considered to be a substitute for a visit to the Tirupati. This is because of a legend that surrounds the construction of this temple. According to popular belief, the temple was built by a devotee who could not visit the Tirupati Temple due to serious health issues. Lord Venkateshwara was moved by his devotion and instructed the devotee to find his idol in the nearby forest, following which the temple was built. Chilkur Balaji is also the only temple in India which has continues to stay out of government control and which does not accept any donations regarding money from its devotees. The temple is so popular that around 75,000 to 1,00,000 devotees visit the temple every week. The increasing fame of the temple is also because the Chilkur Balaji temple is believed to be the 'Visa Temple'. A visit to the temple grants the aspirants with a US Visa and a large number of people bear testimony to this fact! A visit to the Chilkur Balaji Temple while in Hyderabad should be on your to-do-list. One of the oldest mosques in the city, the Mecca Masjid in Hyderabad is one of the largest masjids in India. This revered shrine was commissioned by Muhammad Quli Qutub Shah, the fifth ruler of the Qutub Shahi Dynasty in the year 1614, while the construction saw completion in the year 1694. It is believed that he himself laid down the foundation stone of the edifice, and the arch embellishments over the main sanctum are made from the soil of the Holy Land of Mecca. It is due to this reason that it is called the 'Makkah Masjid' as well. Together with the Chowmahalla Palace, Laad Bazaar, and Charminar, the mosque forms the four very important heritage attractions in the city. However, entry to Makkah Masjid is restricted for non - Muslims. With a capacity to accommodate as many as 10,000 people at any given time, the imposing facade of the Mecca Masjid is indeed a humbling sight to behold. In addition to being an important pilgrimage site, the mosque also houses the tombs of Asaf Jahan rulers and the Nizams. A hair belonging to Prophet Muhammad himself has been safely secured in the premises of the Makkah Masjid as well. With its intricately designed architecture, rich history and religious significance, the Mecca Mosque of Hyderabad is a serene experience of the Divine. ISKON is known all over for being some of the most beautiful, active, spiritual and religious centers in the country. One such ISKON temple can be found in the Nampally region in Hyderabad. The main deity in the temple is Lord Krishna. One can also see idols of Sri Gaura-Nitai, Sri Jagannatha Baladeva-Subhadra and Sri Radha Madana-Mohana. The temple carries out programs of Pujas and Aartis every day while on Sundays, special programs are organized. The architecture of this temple is magnificent. The steps of the temple have various halts that lead to further ends of the temple. By side, there are shops and beautiful fountains add to the spirituality of this shrine. Inside the shrine, the sight of idols makes one muse over the godly world. Draped with rich clothes and jewelry, the idols are decked with great delicacy and care. In the center hall, one can always hear the heavenly tune of Hare Rama Hare Krishna. Many devotional lectures and addresses are arranged for the benefit and spiritual nerve of devotees. Also known as Sri Sri Radha-Madana-Mohana temple at Nampally Station Road this temple serve everyone as a center of the cultural, spiritual, educational and social activities given to raise the lives of people here. The followers hold sessions in institutes, corporates, etc., to teach the techniques of spiritualizing daily life. The Sky Lounge at Hotel Avasa in Hitech City is one of the city's favorites. You get some Tapas cuisine to go with your drinks. The ambiance and the contemporary music adds to the feel of the place. Located at Begumpet in Hyderabad, 10th Downing Street is a splendid restaurant that offers a posh dining experience set against the backdrop of a typical English Pub. As soon as you enter the premises, you are welcomed into a luxurious setting that is endowed with lush seating arrangements combined with exotic lighting and decorations. The vibe of this place is chic and welcoming, with an in-house DJ playing the latest beats for you to dance on. What's more, they have a wide variety of delicious continental, north Indian and Chinese cuisine. If you enjoy your share of mocktails and drinks, this restaurant is just the place for you. From a mesmerizing ambience to attractive offers, 10 Downing Street has got the entire package. 10 Downing Street is a bit pricey but with its price comes its quality. The place offers high-quality products and produce and has many features and extras to it besides the food. This place is quite well is known for not one or two, but a variety of services that it offers to its customers. The newest feature on the menu is the MRP night where you can get imported liquor at low prices. Not just that, the restaurant is also great because of the separate places it has inside it. From a smoking zone and karaoke centre, the place is a must go for groups of almost all ages, being a nice family place and also a good place for college students hanging out. The Toli Masjid is a flamboyant mosque, situated in the suburban area of Karvan, located nearly 2 km away from the Golconda fort. The masjid is one of the many gorgeous memorials in Hyderabad. It is a breathtakingly beautiful example of the architecture of Qutb Shahi. The masjid is embellished by two minarets of about 20 meters on either side.. It was constructed in 1671 by Mir Musa Khan Mahaldar, the known and renowned designer of Qutb Shah. The frontage comprises of five arches, each of which consists of lotus decorations in the spandrels. The main arch is somewhat broader and more elaborate. As per the regal records, the Toli Masjid is also called as Damdi Masjid. With a Spanish style of architecture, the Begumpet Mosque is one the most beautiful structures of the city. Mix - The Westin in Hitech City is another great club in Hyderabad. They serve Chinese, North Indian and Sea Food. The music is good and the ambiancce is ideal for a relaxed evening when you want to enjoy a couple of drinks with friends. It is famous for its Amareswara temple dedicated to Lord Shiva. The temple is one of the famous Pancharamas. Amaravati is also known as Dhanyakataka/Dharanikota. The present holy shrine of Amaralingeswara temple is dedicated to Lord Shiva and is associated with the reign of Vasireddy Venkatadri Nayudu who ruled the region before the advent of the British rule. He was well known for his humanity, magnanimity,nobleness and construction of a large number of temples and education centers in the Krishna river delta. Nizamabad is located around 200 km away from the city of Hyderabad. The city has a dynamic and beautiful blend of Muslim and Hindu population, cultures and livelihoods. While here don't miss the Nizamabad Fort, Saraganpur Temple, Yemcha village, Mallaram, Tilak Garden and the Nizam Sagar Dam. Tourists also have the option of boating at the Nizam Sagar Dam. There are a number small towns, located near the city of Nizamabad, in the districts of Amuru, Banswada and Bodhan. One can take a day trip to these towns dotting the boundaries of the city. AP State Archaeology Museum is now known as Telangana State Archaeology Museum. It is located in the public garden of Hyderabad. It is also one of the most ancient museums not only in Hyderabad but also in entire South India. The site where the museum stood was explored way back in the 19th century by the very well-known archaeologist named Henry Cousens. The architecture of the museum is one of its kind and has its own kind of beauty. It has adapted the Indo-Saracenic style. It is said that the sole purpose of the museum was not just for it to stand as a museum. Its existence is obligated to the last Nizam of Hyderabad who wished to save the culture and heritage of the state of Hyderabad in the middle of the British rule which is why he created the department of archaeology in 1915. From then on, the department played a significant role in exploring and excavating historical sites as well as preserving the ancient monuments. But, later a point reached when there was no place to house the collection which led to the construction of the museum in 1930. It is located in the banks of the River Munneru which is one of the tributaries of the Krishna River. This town's most alluring attraction is the famous Narasimha Swami temple which is located on top of the hill and is said to have been built centuries ago. While in Khammam don't miss the fascinating Khamman Fort, Papi Hills, Madhira, Neeladiri, Lakaram Lake, Nelakondapali, Paranasala, Bhardrachalam,Hanavayagudem Botanical Gardens and the Stambhadri Narasimha Swamy Temple. Visiting the banks of the river might also be a good option, as you can also enjoy boating here. Located at a distance of around 107 km from the city of Hyderabad, this town has been around for many centuries and is a great evidence of Paleolithic and Neolithic sites around the area. The best time to visit this town is from December to February when the temperature is bearable and the weather, pleasant. Its most famous attractions include Nandikonda, Phangiri Buddhist Site and the revered Kollanpaku Jain temple. Among all the lovely attractions in and around the city of Hyderabad, Wonderla Amusement Park is the most exciting one, with its loud and cheerful atmosphere and mind-boggling opportunities to spend an entire day with your family and friends. There is something for everyone at Wonderla - there are water pools for those who are looking for some relaxation under the sun, there are exhilarating, and adrenaline-pumping rides for those looking for adventure and there are rides for casual fun and frolic as well. Kids would especially have a great time in this park as there are rides specially designed keeping in mind the enjoyment and safety of the children. Wonderla also offers many public conveniences so that the visitors do not face any trouble, be it monetary, health or information wise. There are enough food stalls to enjoy a proper meal and souvenir shops to take home something to remember the day. Wonderla is such a place where you can enjoy equally irrespective of your company. Whether you come with your friends or family, the experience remains the same. It is also quite safe for elderly and small children. People visit the park from all around the city as well as those who are in Hyderabad for a trip to enjoy Wonderla Amusement Park. Known as Kashmir of South India, Papi kondalu is a hill range in Khammam district, one should not miss while in this area. These hills are one of the most visited tourist attraction in Andhra Pradesh. The beautiful scenery all around blends with the lush green hills and sparkling skies. The river is clean and a wonderful place enjoy a boat ride. Papi Kondalu also has a wide variety of natural vegetation and wildlife, that spreads across three districts of Andhra Pradesh. Papi hills lies in Eastern Ghats. Papi Kondalu wild life sanctuary is shelter for animals including tigers, panthers, antelopes, hyenas, jackals, spotted deers and many types of birds. Taj Falaknuma Palace is perched around 2000 metres above the city of Hyderabad. Once the royal residence of Nizam- probably the richest man in the world, the palace has now been converted into a five star luxury heritage hotel. Reverberating with sheer opulence and elegance, the palace treats all its guests like royalty. Situated in Jubilee Hills in Hyderabad, Peddamma Temple is a Hindu temple enshrine by •the supreme motherê. She is the most supreme of the 11 forms of village deities. Besides the main shrines, the temple also has idols of Lakshmi, Ganpathy and Saraswati. The temple accepts only coconuts as offerings. Kasu Brahmananda Reddy National Park i.e. KBR National Park is situated in Jubilee Hills, Hyderabad. KBR park boasts of rich flora and fauna and provides a pleasant respite from the din and chaos of the city. Also known as Chiran Fort Palace, the park is divided into conservation zone where entry is restricted and visitorês zone where tourist entry is regulated. Situated in Madhapur area of Hyderabad, Shilparamam is a traditional crafts village created with the idea to preserve and conserve traditional crafts. The village has been set amidst cascading waterfalls and lush greenery; it has sections designated to depict each region of the country. Besides, it has a rock museum, rural museum, a recreational area and boating activities for visitors. GVK One is a gigantic shopping mall situated in Banjara Hills area of Hyderabad. The highlight of the mall is the massive Shoppers Stop outlet sprawling over three floors. The mall also have a six screens INOX multiplex and has over 70 big brand stores besides the parking facility and the huge food court. Sudha Cars Museum is a private museum established in 2010 by Kanyaboyina Sudhakar who displayed hand made cars created by him. All the cars have been personally designed to look like everyday objects. Every exhibit has a plaque stating the time and cost of manufacture and the maximum speed it can attain. The cars can be driven but are not for sale. Located adjacent to the Hussain Sagar Lake in hyderabad, NTR Gardens is a tiny but gorgeous park dotted with bright coloured plants and tall trees. Boasting of well-groomed landscaping, ornate lamp posts and brilliant water fountains, the park also has a souvenir shop, toy train, freefall, restaurants and variety of fun activities for both kids and adults. Located in Banjara Hills, Hyderabad, Jagannath Temple is a modern Hindu temple built by the Odia community dedicated to Hindu God Jagannath- God of the Universe. Constructed in red sandstone, the temple follows the ancient shikhara style pattern. Besides the main deity, the temple has smaller shrines dedicated to Lakshmi, Shiva, Ganesha, Hanuman and Navagraha. Located in the Ibrahim Bagh complex, Taramati Baradari is an olden days inn •saraiê built by Ibrahim Quli Qutub Shah. The building is now a cultural complex which has an open air auditorium for 1600 people, air cooled theatre which can accommodate 500 people, a banquet hall and a multi-cuisine restaurant. Located in the suburbs of Pisal Banda in Hyderabad, Paigah Tombs are a group of tombs of the Paigah royal family. Although now in a derelict and dilapidated state, the tombs still boast of striking architecture and marvellously carved marble panels. The monument is managed by a family of caretakers who reside in the premises. Sprawling over an area of 12.5 acres adjacent to Hussain Lake, Jalvihar is the largest water amusement park in Hyderabad. Besides the conventional slides and swings, the complex has three gorgeous party zones ideal for family parties and occasions. It also has rain dance, indoor game zone, dry rides and an enormous food court. Lumbini Park is a gorgeous urban park named after Lumbini of Nepal. Located alongside Hussain Sagar, the park has an artificial water tank. A huge statue of Lord Buddha is installed in the tank which can be reached through paddle boats. The park also holds musical fountain shows and is an important tourist spot in the city. Overview Hyderabad Tourism Places in Hyderabad Hotels in Hyderabad 0.0 Sanghi Temple Hyderabad | Telangana | India Ranked 36 among Places to Visit in Hyderabad About Sanghi Temple Weather: 31° C Open Time: 8:30 AM - 10:30 AM and 4:00 PM - 6:00 PM Cost: No entry fee Ad Sanghi Temple, Hyderabad Overview Sanghi Temple is dedicated to Hindu God Venkateswara situated at a distance of about 35 kms from Hyderabad in Sanghi Nagar. Perched atop the Parmanand Giri Hill, the temple has a magnificent gopuram and boasts of marvellous architecture. The temple houses idols of other Hindu deities as well and is said to be a replica of the Tirumala Temple. Located within the Paigah Palace Begumpet, Hyderabad; Spanish Mosque is a massive Muslim mosque that can accommodate around 3000 people at once. Also known as Masjid Iqbal Ud Daula or Jam e Masjid Aiwan-E-Begumpet, it has striking architecture similar to that of Spainês. The mosque has a church-like appearance due to its structure and designs and is one-of-its-kind in India. Located in Kukatpally in Hyderabad, Forum Sujana Mall is a shopping mall mostly popular for the launching of its big brand store- Zara. Other than umpteen number of apparel, footwear, cosmetics and jewellery outlets, the mall also have a massive food court and a gaming zone. It also has a nine screen PVR multiplex cinema.